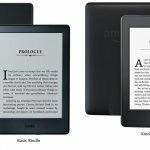 Why would you choose the basic Kindle over other models? The basic Kindle, also called Kindle 5, will woo many book lovers with an improved display, price drop and great design. We’ll look now in more detail at why this base model is still a favorite e-reader despite lacking a touch screen. 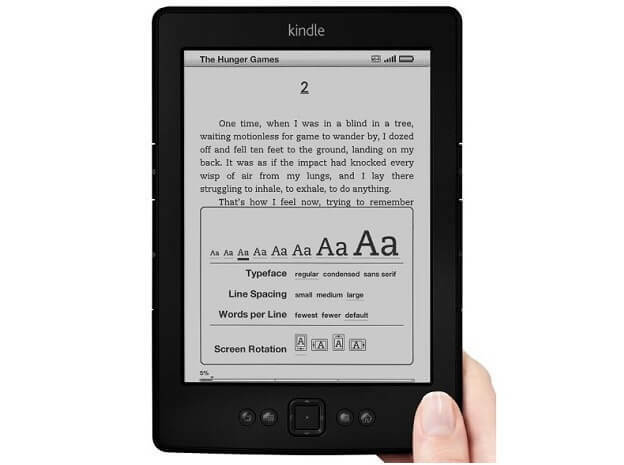 If you are familiar with Kindle 4 (2011), you’ll find this model has lots in common with it. E Ink is much easier to read than even the most advanced LCD or LED displays, especially for long session reading. Though Sony’s Librie EBR-1000EP was the first e-book reader to incorporate E Ink display in 2004, it was not so popular until Amazon Kindle championed E Ink displays in late 2007. 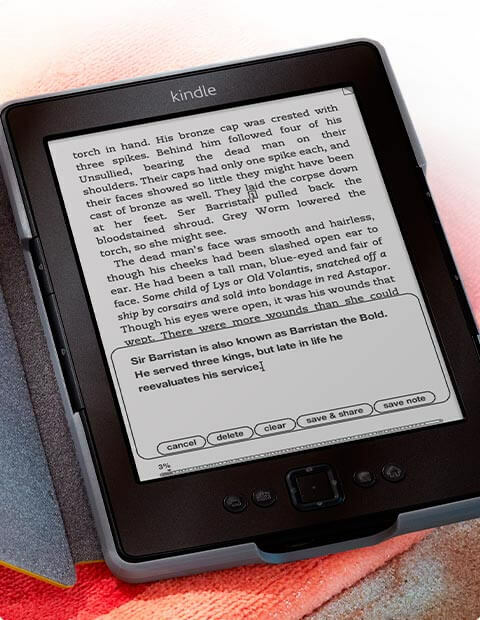 Kindle 5 uses E Ink Pearl display technology, the second generation of Electronic Ink. Pixel density is 167 PPI (pixels per inch). This is not as sharp as Kindle Paperwhite with its 212 PPI. Nevertheless, Amazon has improved the contrast with Kindle 5. Custom fonts further enhance your reading experience. Letters look crisper, clearer and more natural. According to Amazon, the Kindle (2012) display turns pages at least 15% quicker with fewer flashes. With previous E Ink e-readers, you noticed ghosting of previous pages when turning. Now, ghosting is almost non-existent. E Ink displays consume a tiny amount of power. Your Kindle will work for weeks without charging. You’d be lucky to get 7 or 8 hours from the LCD display of a tablet or smartphone. Most importantly, there is no glare with E Ink display. You can even read in direct sunlight fuss-free. There is almost zero eye strain. This is great for lengthy reading sessions. 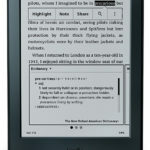 Kindle 5 is available in silver gray or black. This basic Kindle is the smallest and lightest model. It weighs just 5.98 oz (170 gram) and measures 6.5″ x 4.5″ x 0.34″. It’s extremely comfortable to hold even for a long spell. Page turning buttons are found on both sides. The 5-way controller is responsive and easy to use. 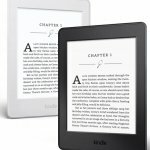 Kindle is not the only e-reader with E Ink. It’s the market leader because it’s a great device. Also, it’s the gateway to a huge selection of media on the Amazon ecosystem. Amazon offers nearly 2 Million e-book titles and more than 180,000 exclusives. If you are an Amazon Prime Member, you can borrow a book each month free with no due date. There are over 200,000 titles to choose from. You can exchange books with other Kindle users. You can also read a sample chapter before buying if you’re undecided. You can even borrow Kindle books from your public library. 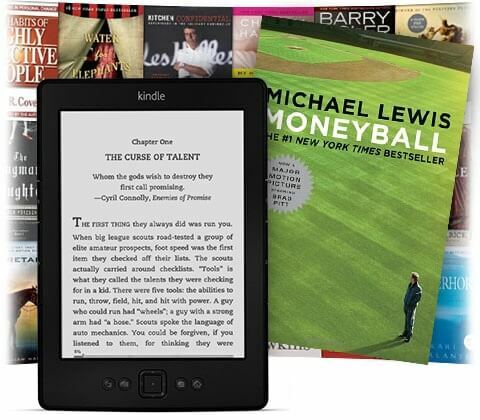 There are free Kindle Apps for every major smartphone, computer and tablet. Amazon’s Whispersync technology automatically saves and synchronizes your position. Notes, bookmarks and highlights are also preserved across all devices with Kindle Apps. You can easily send any web pages to your Kindle or devices with Kindle Apps. Just use the Send To Kindle plug-in. The Kindle 5 display will not self-illuminate in the dark like Kindle Paperwhite. Use a reading light instead. The absence of touch screen can be a nuisance. It’s tough to take notes or navigate extensively with the 5-way controller. You’ll need to buy an AC adapter separately unless you have a spare or can charge through your laptop. A USB cable is included. There’s no X-Ray feature like with Paperwhite or Keyboard. This serves up preloaded information about certain people, places, fictional characters, themes or ideas. If you don’t take notes while reading and don’t mind going without a touch screen or self-illuminating display, this model is ideal. For anyone just starting out with e-readers, there’s no better way to get going without spending a fortune. Last updated by David Richardson at February 15, 2018 . Thanks for the informative details. Please fix your spelling mistakes.